Indian Coast Guard seized a trawler carrying 250 endangered baby sharks and arrested seven fishermen aboard the vessel for poaching the marine species on the night of January 22, within Odisha's Gahiramatha Marine Sanctuary in Kendrapara district. “We intercepted the trawler within the marine sanctuary and found around 250 dead Bull, Spot Tail and Hammerhead sharks from the its storage room,” said Bhutanath Mahato, Coast Guard Commandant of Paradip. All the seven arrested fishermen were booked under the provisions of the Wild Life (Protection) Act, 1972, added Mahato. The shark population in the waters off Odisha’s coast is on the verge of extinction as every day, a large number of marine fishermen illegally kill hundreds of them, particularly baby sharks, said Biswajit Mohanty, a noted environmentalist and the secretary of the Wildlife Society of Odisha (WSO). “Many traders from West Bengal, Andhra Pradesh, Tamil Nadu and other areas slyly take quintals of baby sharks from the state under the very noses of the fishery and forest officials. 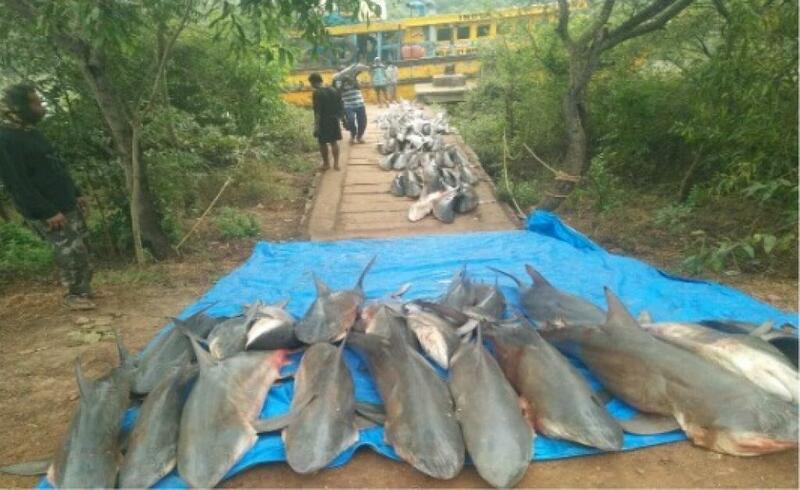 A large number of local fishermen earn extra money by supplying sharks clandestinely in fish packages,” added Mohanty. To save sharks, the Union Ministry of Environment, Forest and Climate Change listed ten species in Schedule-I of the Wild Life (Protection) Act, 1972, thereby according them the highest degree of protection. The Union government has also prohibited the removal of shark fins on-board a vessel in the sea. Possession of shark fins that are not naturally attached to the body of the shark, would amount to "hunting" of a Schedule-1 species. Sharks, rays and skates are an important part of the marine ecosystem. They play an important role in the maintenance of the marine ecosystem like tigers and leopards do in the forests. India is known to be home to about 40-60 species of sharks, added Mohanty. However, the population of sharks has declined over the years due to several reasons including over-exploitation and unsustainable fishing practices. Due to the high demand of shark fins in the shark fin-soup industry, it has been reported that fins of sharks captured mid-sea are removed on the vessel itself and the de-finned sharks are thrown back into the sea to die a painful death. This has not only resulted in the inhuman killing of a large number of sharks and in this process, has further decimated the population of the Schedule I species. This practice, prevailing on board shipping vessels, has led to difficulties in the enforcement of the provisions of the Wild Life (Protection) Act, 1972 since it becomes difficult to identify the species of sharks from the fins alone, without the corresponding carcass, from which the fins have been detached, added Mohanty. The trade in shark fins, which are in high demand for culinary use in many countries of the Far East, has led to a surge in shark catches to the extent that the shark populations are now in danger.